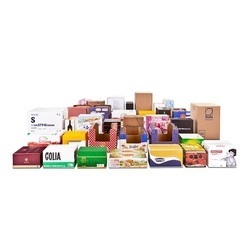 Our range of products include printed boxes and printed box. Industrial Use Gift & Craft,TV,AC,Shoes etc. We are a renowned and customer centric firm, which is engaged in delivering a comprehensive range of Printed Boxes which are used for many household items. We also design these boxes as per customer need. Together with this, we design and develop die cut boxes after understand client product and services. Printed boxes have different features like they are different size and pattern, high capacity, suitable for transport and able to store heavy products.